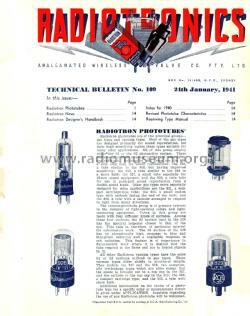 Radiotronics commenced in 1935 initially with two versions of the magazine, Technical Bulletin and Experimenters Bulletin, both versions using the same page heading and page layout. From November 1936, Technical Bulletin, No. 70 and those following, incorporate the experimenters section. They were published by Amalgamated Wireless Valve Company Pty. Ltd.(AWV), Sydney, Australia until 1969, with some gaps during WW2, recommencing in1946. For many years the editor was Fritz Langford-Smith, the AWV Applications Engineer, who became famous for editing/writing the “Radiotron Designers Handbook”, originally published by AWV, and later re-printed by RCA in the US and by a technical book publisher in England. No other book printed by RCA ever mentioned “valves”, or type numbers made by other manufacturers! 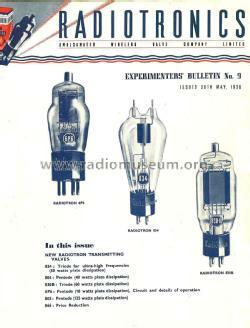 Radiotronics contained a great deal of non-copyright technical information about Valve technology, most of which wasn't published anywhere else in the world, and a few reprints of other material. 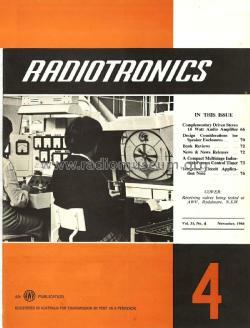 Several times during its life Radiotronics changed the method of numbering issues and pages also the number of copies per year. Information from the late, Peter Ward, VK3ZAV.